This is a raw site map, listing all articles. It is not frequently updated. Please go to the CONTENTS section of the site for a more useful categorised lists of articles, and descriptions. The summaries of all the articles are accessed on the contents page. They will give you a short description of each article, unlike this page which is merely a list of titles. in addition, the media on the website is not listed here, but only on the media pages, such as video, audio, books and music. The Transforming Church: Part One of a ten-part series on the churches of today. A Friendly Discussion on the Topic: Can A Christian Have a Demon? Amateur Music by Tricia Tillin - a history of the renewal in song! 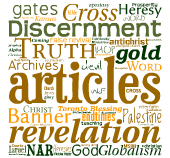 Banner Ministries Special: Why no more "Mainstream"? Prophecy given by David Noakes at Moriel Conference 'New Beginnings' Nov 1997. Cross+Word Article exploring What Happened to George Tarleton? zipped file of short video with Silvania Machado and Ruth Heflin manifesting "gold dust"
Gold Miracles also Happening at Marian Sites! Toronto Blessing: Testimony of a visit to Ken Gott's Church at Sunderland. Would Maria Woodworth-Etter have approved of the Toronto Blessing? Ten Reasons to Reject Word of Faith Teachings - the Original! !